Artist Linda Ford in her studio. For Linda Ford, the roots of artistic expression run deep. “My grandmother painted, my mother loved the arts, my parents were very encouraging. I can't remember not being involved in art,” Ford said during an interview at her serene studio in Hockessin. Ford grew up in the Hockessin and Yorklyn areas, went to A.I. DuPont High School, then studied at the Kansas City Art Institute. She spent 31 years as the art teacher at St. Mark's High School, encouraging young artists to explore their own avenues. All along, Ford was making her own art. A hot plate holds the tinted encaustic medium Ford uses in her paintings. Twenty years ago, Ford heard about working with encaustic, a wax-based medium. Four years ago, she took a workshop and has been exploring ever since. Her abstract panels are energetic, layered with colors and scratches and lines that suggest different things to each person who sees them. 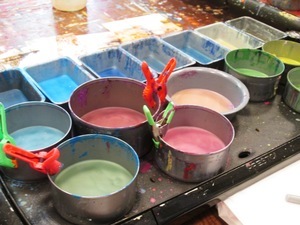 There's an ordinary hot plate in Ford's studio where she puts cans of wax and pigment. When they're heated, they can be brushed onto prepared boards in layers until they harden. “Once they're hard, you can scratch them and reveal layers underneath. I can take a razor blade and scrape, and things will come up,” Ford said. “The coolest thing is that you can buff them and get this luminosity,” she said, rubbing the surface of a painting in her studio. Encaustic is an ancient medium, and despite being wax-based, “They're really permanent,” Ford said. “In direct sunlight they might get a little soft,” but they are not fragile or prone to dripping. “You can go ahead and touch them – it's not going to hurt them. While her abstracts call up images to her – “this looks like wisteria blooming, here,” she said, gesturing to one of her paintings – she has a tradition of throwing a party before her exhibitions and asking her guests to come up with titles. “This last time, three of my grandchildren titled paintings. One of them said, 'Oh, that looks like a parrot's tail,'” Ford said. “To me, they're about color, form. I just respond to the movement. Sometimes I'll see new things in them after they're done. If I haven't seen one of them in a while, I'll look at it and think, 'Man, I don't remember doing that,'” she said, laughing. Ford at the opening for her latest show at the Station Gallery in November. 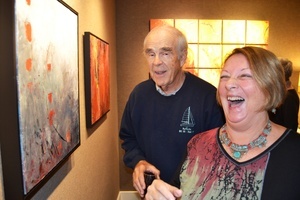 Ford has had a long relationship with The Station Gallery in Greenville, where she had a solo show through the end of November. A new series is based on Tibetan prayer flags. The square prints on paper are backed with scraps of real prayer flags that have been shredded by the wind and the elements. There are tiny details – twigs, stones, strands of wire – that function as elements of the composition but also call up themes of permanence, transcendence and faith. Ford's world travels are reflected in her work, sometimes literally. She has a pile of snapshots on her work table that show interesting textures she's run across. There's the rusted, pitted floor of a boat. There's a wall in the Athens Underground. And a wall in Calcutta, she thinks. “One time, I made my friend take a picture of this side of a garbage can. It was square, and the composition of it was almost like a Rothko. She took the picture,” Ford said, smiling. Ford said she can foresee a point where her two mediums will cross over – encaustic and collage. “I've played around with that a little bit,” she said. “I have an idea that's where it might go, but if I have too much of a preconceived idea, it doesn't work.